Happy birthday to Martin Freeman! That’s right — today Martin is 42. 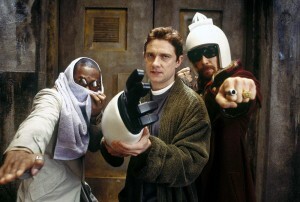 We reckon that’s pretty awesome seeing as Martin played the role of Arthur Dent in the Hitch Hikers Guide To the Galaxy Movie. Happy birthday, Martin! Martin is, of course, best known for his portrayal of Tim Canterbury in The Office, Dr. Watson in Sherlock, and our own Bilbo Baggins in Peter Jackson’s The Hobbit film trilogy. Check out our little gallery of photos of Martin below, including a few from Sherlock and plenty from The Hobbit. * If this rather geeky little joke leaves you confused, enlightenment can be found in Douglas Adams’ science fiction series, The Hitch Hikers Guide to The Galaxy.